Here’s what’s on Blu-ray Disc this week: Several editions of Tron (including the 3D version and classic), Taxi Driver (Scorsese’s 1976 classic starring Robert De Niro), The Chronicles of Narnia: The Voyage of the Dawn Treader, Kung Fu Panda (now available in 2-disc Blu-ray/DVD Combo), A.I. : Artificial Intelligence (2001 directed by Steven Spielberg) and Arthur and Arthur 2: On the Rocks – the first of which is a comedy classic. 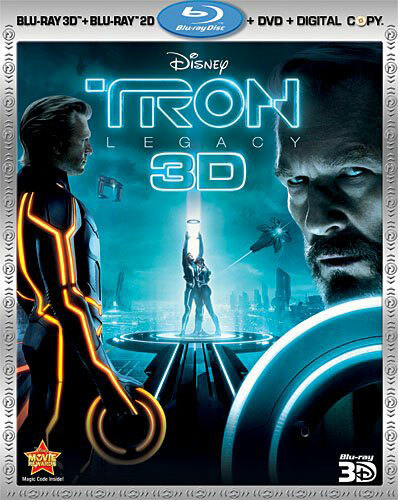 Tron: Legacy, the 3D remake of the original Tron from 1982, is available in several editions including a 5-disc combo (the best value) containing Blu-ray 3D and 2D versions of the film, a digital copy, DVD, and the original film. The Blu-ray discs contain plenty of extra content, BD-Live features, and audio formats in both DTS-HD Master 5.1 and DTS-HD Master 7.1. This edition retails for $79.99 but is currently available for $49.99. Tron is releasing in so many different Blu-ray editions it boggles the mind, and might be the most complicated release we’ve seen so far. In addition to the 5-disc combo mentioned above, you can get the single-disc BD/DVD combo Blu-ray of Tron: Legacy, or single-disc BD/DVD combo of Tron: The Original Classic. You can also get the four-disc BD/DVD combo of just Tron: Legacy that doesn’t contain the 1982 film. There is also a limited edition Tron: Legacy/Tron: The Original Classic Identity Disc Collectible Packaging that lists for $99.99, and a Walmart exclusive which includes a die-cast light cycle. Take a look at all this week’s Blu-ray Discs now available at Amazon.com.